I’m always afraid to start book series because the second book rarely lives up to the first. For some reason, the second book always seems like more of a way to get from A to C without really having much of a point. The Madness Underneath is not one of those books. It’s definitely not a book that can stand by itself, but it is its own book and serves a greater purpose than tying book 1 to book 3. The Madness Underneath deals with the aftermath. The aftermath of the attack on Rory, the aftermath of her newly discovered power, the aftermath of what happened in the bathroom at Wexford. There’s a lot of material to work with in this book and Johnson does a suburb job of handling it all. 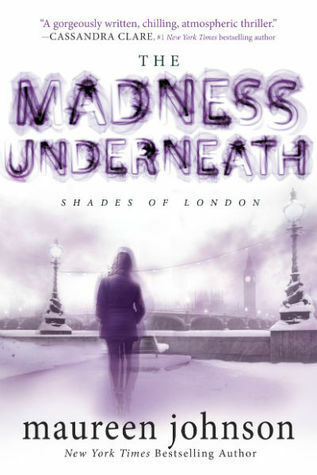 Rory has been living at home with her parents, but just wants to get back to her life in London. She wants to go back and act like she’s the same person she was before everything happened. Once back at school, she realized she’s bit off a little more than she can chew. The world didn’t stop for her while she was gone, and now she’s lagging just a little bit behind everyone else. On top of that, she still has to deal with her new ghost knowledge and powers. There are things going on that only she and a few of her friends know about, but even they aren’t sure how to handle this new situation. The Madness Underneath didn’t have me fearing every little noise, but it still had a sense of creepiness. There was no way to guess at what was about to happen and the ghosts are still sticking around. This was a book even better than the first. After the major cliffhanger in The Name of the Star, I thought I’d be able to handle anything Johnson threw at me. But the ending of The Madness Underneath punched me in the gut. I simply cannot wait to read what comes next. Thank you to Putnam and NetGalley for an advanced copy of the novel in exchange for an honest review. This entry was posted in Something a Little Different, The Must Reads, Young (and New) Adult and tagged Fantasy, Maureen Johnson, Must-Reads, Paranormal. Yeah, the ending was ridiculously crazy/good. I actually liked this novel, more than the The Name of the Star.